The US Forest Service has opened a $1.7 million plant that will produce cellulose nanocrystals (CNC) from wood by-products, like wood chips and sawdust. The end result is stronger than Kevlar or carbon fiber, with similar low-weight advantages. CNC is also transparent, making it an alternative to ballistic glass. The real selling point is the low cost. CNC from wood can cost less than 10 percent of carbon fiber or Kevlar. The current goal for is $10 per kilogram, but large-scale production should reduce that figure to $1 or $2 per kilo. Cellulose, found in the cell walls of plant and bacterial cells, is made of long chains of glucose molecules. Plants arrange these fibers into webs that create structural support for cells. 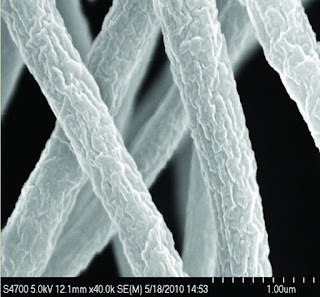 Wood is basically a network of these fibers, and a typical cellulose fiber measures about 10 microns wide and 1 millimeter long. Wood, when broken down into pulp, loses its lignin, which holds together all the cellulose fibers, leaving them suspended in water. When it dries, it’s about as tough as a lint ball, but when it’s further broken down into nanofibrils, they join via hydrogen bonds. A strong acid then gets rid of the excess, leaving behind individual cellulose nanocrystals, the strong stuff. About 30 percent of a wood pulp collection can become CNC. There are some drawbacks, specifically with water. Given enough of it, cellulose will swell with H20 to nearly double its dry volume, then fall victim to nano-defects in the cellulose structure. Researchers are looking for paint or hydrophobic treatments that can keep out water and preserve CNC’s strength.